The game systems I have owned are, in order, an NES, Super Nintendo, Playstation, PS2 and a Wii. That means about 90% of the videogame figures I own are from games I've never played, sold solely by virtue of the design. 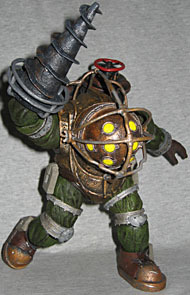 The newest member of that group is BioShock's Big Daddy. "I am Andrew Ryan, and I'm here to ask you a question: Is a man not entitled to the sweat of his brow? No, says the man in Washington. It belongs to the poor. No, says the man in the Vatican. It belongs to God. No, says the man in Moscow. It belongs to everyone. I rejected those answers. Instead, I chose something different. I chose the impossible. I chose... Rapture. A city where the artist would not fear the censor. Where the scientist would not be bound by petty morality. Where the great would not be constrained by the small. And with the sweat of your brow, Rapture can become your city as well." When it comes to attention-grabbing introductions, BioShock is right up there with The Matrix Super Bowl commercial. There we were, enjoying a rather staid E3 presentation, when suddenly we see a trailer for a game no one had ever heard of: it's first-person, and you're wandering around an abandonned city. You try to help a lost little girl, when out of nowhere comes a monster in a diving suit. He drills a hole in your hand, and it seems you bleed bees, which you can then throw at the monster. Then the little girl cracks you with a crowbar and throws you over a ledge. All together now: "What the great holy hell was that!?" 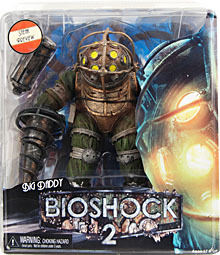 This figure is actually labeled as a sneak preview for the BioShock 2 figures, due in 2010. The clamshell is much larger than the average NECA packaging, measuring 10½" high, 9" wide and 5½" deep: they've sold two-packs in smaller packages than this! Of course, if you're familiar with the Big Daddy design, you'll understand why the clamshell needs to be so sizeable. In other words, Big Daddy is big. His "head" is only about 6" from the ground, but he's hunched over, so the full figure is right around the 8" mark. A conservative pose will still require at least 7½" of horizontal space. The various accoutrements on his suit mean he's 6" from front to back. So seriously, Big Daddy. He's so big, he's not even fully assembled in the package: the two tanks on his back are packed next to him in the tray and must be plugged in once you get him out of his twist-ties. And even still, I'm not sure how big the character is supposed to be: it's entirely possible he's still too small. NECA's Randy Falk gave an interview recently where he talked about how Big Daddy wasn't just sculpted, he was machined, and that's quite clear on the final product. 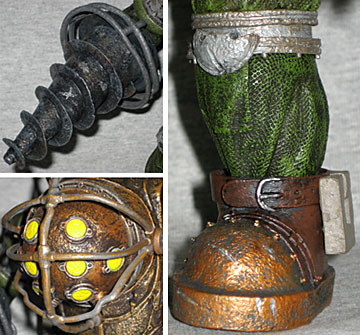 Big Daddy's familiar design is clearly based on an old-fashioned dive outfit; the thick canvas suit, the metal helmet with small portholes... yes, it's given a retro-futuristic bent, but the original idea is clear. The "cloth" is heavy and textured, and the metal bits show their age both through the pitted surface and well-chosen cracks and breaks. 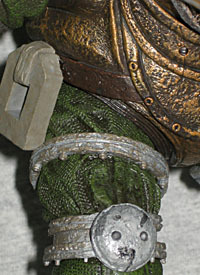 Large metal joints allow the character movement, though they don't quit match up with the toy's joints. 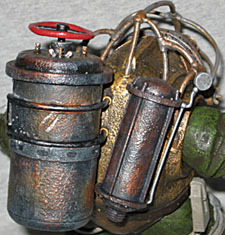 A battered and bent cage of pipes protects Big Daddy's head and neck, and large weights are attached to his waist and ankles. As we mentioned, there are two tanks on his back. The larger tank seems to be held onto the wearer's suit via a large curved clamp, and has a red wheel valve on the top, with the lid shut tight with wingnuts. The smaller tank has riveted rims, and a pressure gauge coming off the side. Big Daddy's signature weapon is the giant auger in place of his right hand, which also gets a bumper cage around the wrist. The mechanical parts are more the product of industrial design than sculptural work, but that just adds to the miniaturized realism. Though he's a big, bubbly toy, Big Daddy has good articulation. He moves at the shoulders, elbows, left wrist, hips, knees and ankles, and all 11 points are swivel/hinge combos, which means they might as well be balljoints. The drill can turn on its wrist, but it's rather stiff, so you really have to crank it. Other than that, though, some of the joints were tough to get moving, but all ended up going freely once they were unstuck. Aside from the elbows, the joints are hidden by the sculpt: the shoulders poke out of the metal chestplate, the hips disappear into rubber seals, the wrist and knees are covered by the sculpted swivel joints, and the leather belts around the lower legs conceal the ankles. If you care about such things, the articulation is hard to notice. Jon Wardell and Geoffrey Trapp are both credited with the paint, and it's beautiful. The cloth parts of the costume are a dark green and have dark shadows in the wrinkles, but what really sets this toy apart is the superb job that was done to make fresh new plastic look like tarnished old metal. The "eyes" are yellow, indicating that he is neither hypnotized or angered, and the cracks are slightly darker. Washes, drybrushing, well-selected spot apps and more all add up to a great look. There are dings and scratches suggesting years of use, and it all looks natural, not like something that was painted on the surface of a toy. Excellent, excellent stuff. 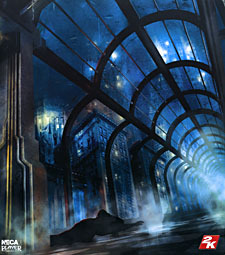 BioShock takes place in the underwater city of Rapture, and the packaging insert shows a lovely backdrop of a glass-encased hallway, with more buildings visible through the water. Rapture was built in the 1960s by Andrew Ryan, whose name might be a bit of a giveaway that Rapture is based on the ideas of Ayn Rand. If you don't know who Ayn Rand is, she's the one who came up with all the ideas that Right Wing crackpots take their "we're better than you" ideals from. In fact, the city of Rapture is basically a Gulch, a closed community of the well-to-do who are only insterested in individual benefits for themselves and Capitalism over all. Randian philosophy is basically the direct antithesis of Communism, and is in reality just as unworkable: it just makes the mistake of assuming the importance of individuals, whereas Communism mistakenly relies on the altruism of the whole. 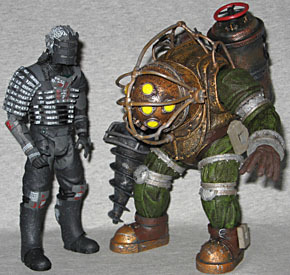 Big Daddy is a cool figure, but you have to wonder if it's too accurate for its own good: we all know that TRU has been a great friend of NECA lately, but will they be willing to dedicate so much shelf space to a single figure? We're already seeing the first signs of market saturation: is there a TRU in the country that doesn't have a handful of Prototype figures and a couple of Bionic Commandos? Just this week, NECA announced the only way to get their upcoming Dante figure is to preorder the associated videogame from select retailers, which doesn't bode well. 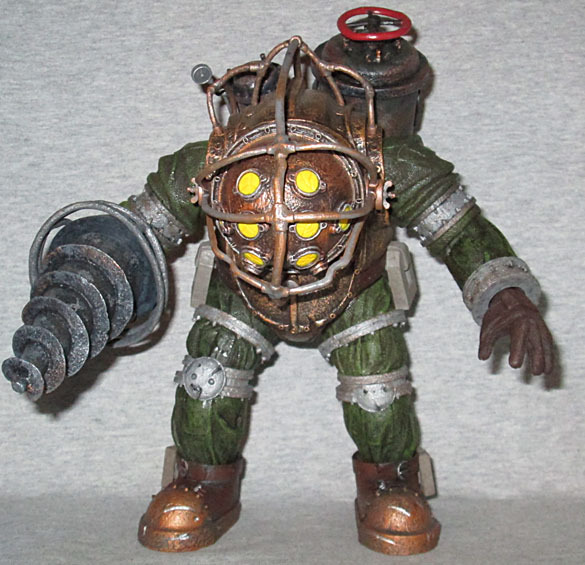 So if you want a Big Daddy, you have to decide whether to order one now and buy from a specialty store, or whether to hold out and show TRU you support their effort to cater to collectors.